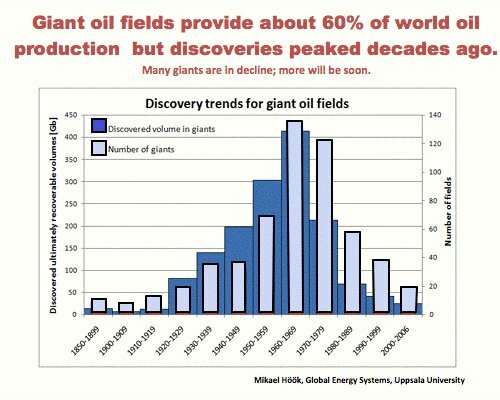 When Will the Giant Oil Fields Fall? Unfortunately, U.S. sentiment toward domestic oil production is a case of foggy optimism. Look at the facts: U.S. production peaked at just slightly over 10 million barrels per day in November 1970. Domestic production that year averaged approximately 9.6 million barrels per day. That's it. There's no getting around it. To think we'll ever return to our glory days is nonsense. It won't happen. Yet despite this decline, we still see rampant optimism. In March, U.S. crude oil production was about 5.6 million barrels per day. That's a 2.3% increase over the same period in 2010. See that tiny up-tick at the tail end of the chart? That's the best news we've had in four decades, and it's merely a dent in the big picture. Meanwhile, consumption is once again north of 19 million barrels per day. Now, we're not trying to detract from the good news. The rise in unconventional production over the last few years is the reason there's any optimism at all. But unfortunately, it's also giving us a false sense of security — a muddled cushion that allows us to continue believing all is well with our oil supply. All is not well. And things get even worse when you look at the bigger decline picture. Erase any doubt you might have regarding the importance giant oil fields play in global production. To be considered a "giant", the field is believed to have 500 million barrels of ultimately recoverable oil or gas equivalent. Only a handful of those fields — the top 20, in fact — account for roughly 25% of global oil production. Also consider that nearly all of these fields have passed their peak and are now in decline, with an annual decline rate of approximately 6.7%. In certain OPEC members, the loss of production from these giant oil fields could be catastrophic. More than 90% of Saudi Arabia's production comes from just 6-7 fields. The largest of the bunch is Ghawar, at which Saudi Aramco is forced to inject ever-increasing amounts of seawater just to keep the field's production on life-support. This problem isn't unique to the Saudis. The same can be said of the top oil-producing countries in the world. In Iraq and Kuwait, nearly all of production stems from just a handful of giant oil fields. So we can't help but wonder how long the charade will last. After all, the world's giant oil fields have been in production for at least 40 or more years. You might be saying to yourself, "Not a problem — we'll just go out and find more of these blockbuster oil fields and the problem is solved, isn't it?" That's not exactly the case. The giant oil discoveries of today aren't just harder to find; they're also much more expensive to produce. So here's the rub: Giant oil fields are becoming scarce. Even though these fields provide about 60% of global crude production, we're simply not finding any more of them. Furthermore, the ones we do manage to find aren't the same as the Ghawars and Burgans, relics of better oil discovery days. Allow me to give you an example: the highly-touted Tupi oil field. When it was announced, the U.S. was busy licking its chops in anticipation, and Brazil couldn't wait to fill its coffers. Located in the Santos Basin off the coast of Rio De Janeiro, the 5-8 billion barrels of recoverable oil were as good as it gets in today's Peak Oil climate. We're constantly told the Tupi field is the largest oil discovery on this side of the world in the last three decades. But what we also have to realize is that some of this oil is buried beneath almost 7,000 feet of water — then an additional 16,000 feet of rock and salt. Cantarell was once one of the three largest oil-producing fields in the world. Following its peak production in 2000 at 2.1 million barrels per day and subsequent steep decline, the field isn't even the largest in Mexico, having taken a backseat to the Ku-Maloob-Zaap complex. 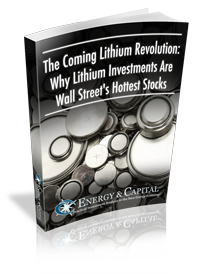 The good news is in all of this is we have a road map to show us where production is headed. In Canada, a war is brewing over who will receive crude oil from Alberta's oil sands resource. While the United States continues to fight over the proposed Keystone XL pipeline (a decision on the pipeline is expected later this year), which will ship up to 900,000 barrels of oil sands production to U.S. refineries, the Canadian oil sands is becoming more attractive to Asian markets. In 2010, oil sands deals from Asia tripled — mostly from China, Japan, Thailand, and South Korea. In total, nearly $10 billion was spent last year by Asian energy companies, an 85% increase over 2009. Some of the investment opportunities in the oil sands are simply too good to overlook. We're coming up on potential shift to in-situ production, a method that will allow Canadian producers to reach up to 80% of the bitumen too deep to be mined. U.S. crude stockpiles are down; demand already outstrips supply, and the IEA says a tidal wave of emerging market refineries is coming online and will demand to be fed... Where will the world get its oil? Chris DeHaemer tells readers the two places that will supply the globe with crude in the years to come, and how you can profit. Weekend: Is an Oil Supply Crunch Ahead? Why are the latest IEA warnings over high oil prices falling on deaf ears? Keith Kohl explains as he brings readers the week's top investment ideas. Energy and Capital editor Keith Kohl explains why OPEC's trillion dollar profits are in danger. Energy and Capital editor Keith Kohl explains why the war between natural gas and coal stocks will end with only one clear winner.